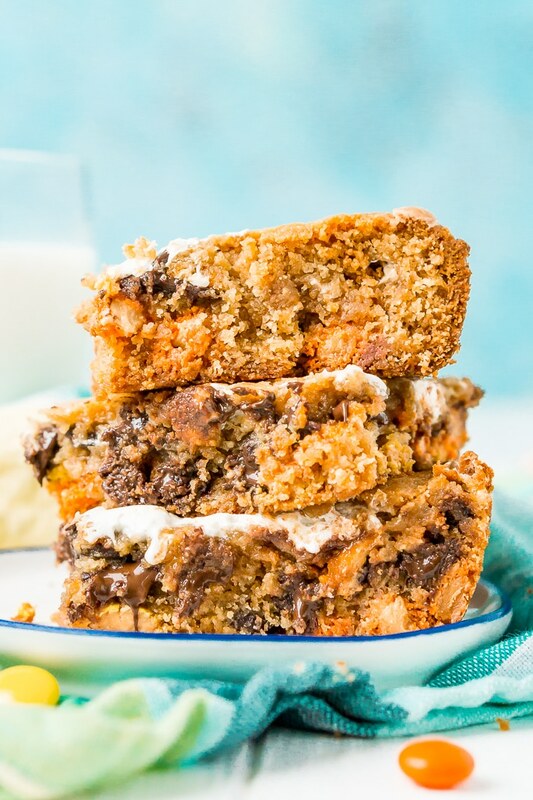 These Peanut Butter Fluff Blondies are a sweet and chewy dessert that’s loaded with chocolate chips and Reese’s pieces with a marshmallow swirl! When it comes to desserts, I love them all, but at the end of the day, I’m a brownie girl at heart. But I love blondies too, especially these Peanut Butter Fluff Blondies which are every bit as rich and sinful as it’s fudgy chocolate sister! Almost 4 years ago now, I attended a baby shower where these Peanut Butter Fluff Blondies completely stole my heart. They were so good! I must have had three of them at the party, and they were all I could think about for days after. I finally broke down and messaged the mother-to-be asking her to track down the maker of this amazing dessert. She got right back to me, and the girl who made them, Megan, was more than happy to share the recipe and to let me share it with all of you here on the blog! I will forever be in Megan’s debt for giving me this recipe, as will all of you. Now some of you are probably like “peanut butter and fluff… boring!”. 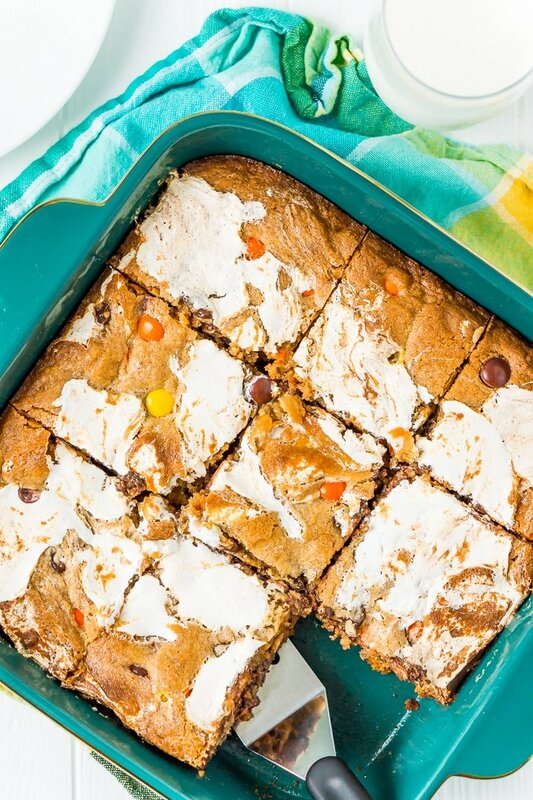 Well, you’d be wrong, there is nothing boring about these Peanut Butter and Fluff Blondies. 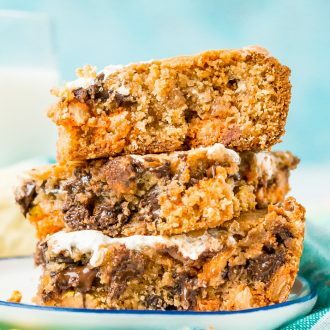 They are packed with milk chocolate chips and Reese’s pieces, and chewy like you wouldn’t believe! Everyone is sure to love them. These blondies are chewy, sweet, and completely addicting. The melty chocolate chips and Reese’s pieces add great texture and depth to this rich dessert. However, it’s the fluff ripple through the middle that makes these blondies absolutely perfect. These Peanut Butter Fluff Blondies would be great for bake sales, a potluck, or to enjoy with a Great British Bake Off marathon on a Friday night (like we did). <<< Yeah, we’re old. I hope you get a chance to make these soon and don’t forget to grab a gallon of milk to go along with them, trust me, you’ll need it! Overall this is a pretty easy recipe to make, but there are a few things to note and some things that could make it even easier to prepare. Like brownies, you can bake this recipe in a number of different sized pans. If you like your blondies a little thinner, I recommend using a 9×13-inch pan to make them in. With the larger pan, I would bake for 25-30 minutes. If you like your blondies a little thicker, I would recommend a 9×9-inch or 10×10-inch pan. Personally, I feel like 8×8-inch pans are just a tad too small for this recipe if you want a decent bake. For a 9 or 10-inch square pan, you’ll want to bake for 35-45 minutes. Remember that bake times can also vary based on pan type, not just size, so start at the low end and keep an eye on them, once the center is set, meaning that if you move that pan a bit the center doesn’t wiggle, remove from the oven and allow to cool before cutting. If you find that your edges and top is starting to brown up but the center hasn’t set yet, loosely wrap the top with aluminum foil and continue to bake. Make sure to spray your pan with non-stick cooking spray even if you’re using a non-stick pan. Marshmallow Fluff is really sticky stuff, I find that spraying a rubber spatula with cooking spray or greasing with butter makes it easier to manage. 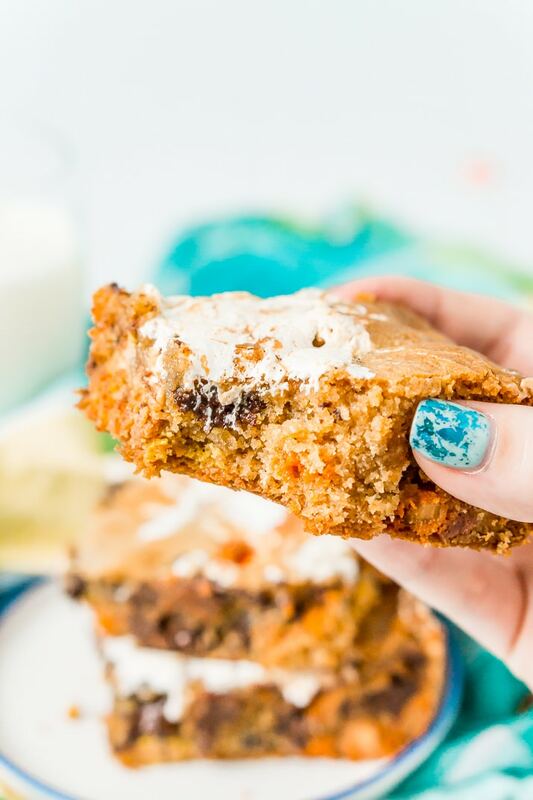 Pin these Peanut Butter Fluff Blondies for Later! This post was originally published October 14, 2013. 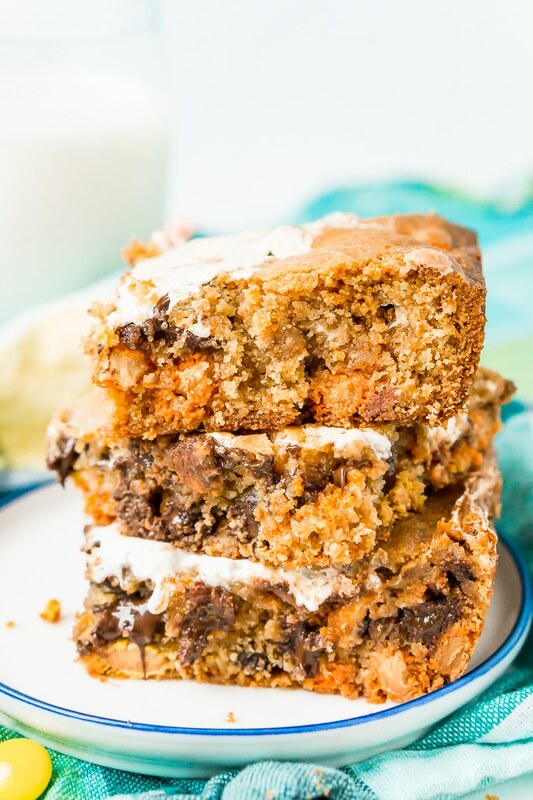 These Peanut Butter Fluff Blondies are a sweet and chewy dessert that's loaded with chocolate chips and Reese's pieces with a marshmallow swirl! Preheat oven to 350 degrees F. Grease either a 9x13-inch or 10x10-inch baking pan with cooking spray. In a large bowl or stand mixer fitted with a paddle attachment, cream together the butter, brown sugar, and peanut butter until light and fluffy, about 1 minute. Add eggs one at a time, mixing between each addition, then add in the vanilla and combine. Scrap down the sides of the mixing bowl as needed. In a separate bowl, whisk together the flour, baking powder, and salt. Add the flour mixture to the wet ingredients in two parts, mixing after each addition. Add about 2/3 of the batter to the greased pan, make sure it's spread out evenly and covering the whole pan. Drop the marshmallow fluff on top of the batter in the pan and spread it around. If you grease the rubber spatula before scooping out the fluff, it will make it easier to spread. Spread the remaining batter over the fluff. You can add some additional fluff on top if you'd like. Bake for 25 to 30 minutes for a 9x13-inch pan or 35 to 45 minutes for a 10x10 or 9x9-inch pan. See notes for more bake time details. Like brownies, you can bake this recipe in a number of different sized pans. If you like your blondies a little thinner, I recommend using a 9x13-inch pan to make them in. With the larger pan, I would bake for 25-30 minutes. If you like your blondies a little thicker, I would recommend a 9x9-inch or 10x10-inch pan. Personally, I feel like 8x8-inch pans are just a tad too small for this recipe if you want a decent bake. For a 9 or 10-inch square pan, you'll want to bake for 35-45 minutes. Remember that bake times can also vary based on pan type, not just size, so start at the low end and keep an eye on them, once the center is set, meaning that if you move that pan a bit the center doesn't wiggle, remove from the oven and allow to cool before cutting. If you find that your edges and top is starting to brown up but the center hasn't set yet, loosely wrap the top with aluminum foil and continue to bake. Make sure to spray your pan with non-stick cooking spray even if you're using a non-stick pan.